Soyuz 5: Re-entry direction and attached Service Module – (Credits: International Astronautical Federation). On January 18th, 1969, Soyuz 5 was returning back to Earth after a successful mission involving docking with Soyuz 4, followed by the transfer of two cosmonauts from Soyuz 5 to Soyuz 4. Following the retrofire, the service module failed to separate from the reentry module, resulting in the spacecraft reentering the atmosphere hatch-first, the most aerodynamically stable orientation. The resultant aerodynamic and thermal loading caused the hatch to bulge inward and the hatch seal to smolder, spreading fumes into the cockpit. Piloting the spacecraft became increasingly difficult, as the cabin filled with smoke and Boris Volynov, single astronaut onboard, was pressed outwards from his seat against the restraint harness. Fortunately the struts connecting the service module to the reentry module disconnected due to mechanical and thermal loading, resulting in the separation of the service module. The reentry module was then able to re-orient itself correctly, exposing its thermal protection in the direction of the velocity vector. Following the attitude correction, the spacecraft continued on a 9G ballistic reentry, deviating from its planned trajectory by 2000km and landing 2km southwest of Kustani. The parachute deployed correctly, but shortly before touchdown at 07:78 GMT, a failure occurred in the soft-landing rockets. Consequently, the reentry module struck the ground much harder than usual, throwing Volynov from his harness across the cabin and breaking several of his teeth. Volynov walked away from the landing site to Kustani, through snowy, -40-degree temperatures, where he was recovered by rescue crews. 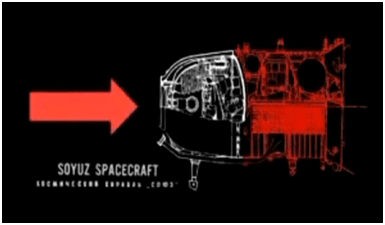 The video below discusses the sequence of events during the reentry of the Soyuz 5.